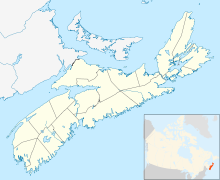 Canadian Forces Base Shearwater (ICAO: CYAW), commonly referred to as CFB Shearwater, is a Canadian Forces Base located 4.5 nautical miles (8.3 km; 5.2 mi) east southeast of Shearwater, Nova Scotia on the eastern shore of Halifax Harbour in the Halifax Regional Municipality. Shearwater Heliport, which is operated by the Royal Canadian Air Force. The primary RCAF lodger unit is 12 Wing, commonly referred to as 12 Wing Shearwater. 12 Wing provides maritime helicopter operations in support of the Royal Canadian Navy's Atlantic Fleet (MARLANT) from the Shearwater Heliport and Pacific Fleet (MARPAC) from the Patricia Bay Heliport in British Columbia. 12 Wing is also headquartered at Shearwater Heliport. Shearwater Jetty, the former CFB Shearwater Annex, which provides dock facilities in support of Fleet Diving Unit Atlantic and MARLANT warships. Shearwater is the second-oldest military aerodrome in Canada. In August 1918 the US Navy established Naval Air Station Halifax on the shores of Eastern Passage to support flying boat patrol aircraft. The seaplane station was taken over by the Air Board in 1920 for civil flying operations, and later developed by the Canadian Air Force and the Royal Canadian Air Force. The station was known as RCAF Station Dartmouth through the Second World War. In 1948, the Royal Canadian Navy took over the facility, naming it HMCS Shearwater, also known as Royal Canadian Naval Air Station Shearwater (RCNAS Shearwater). The combined land and sea-based aerodromes were used to station carrier-based maritime patrol and fighter aircraft. Shearwater was also the home to early experiments with ship-borne helicopters—something which was copied by navies around the world. During the 1960s, the aerodrome at the former RCAF Station Debert was attached to HMCS Shearwater as a training location for carrier landings. The February 1, 1968 unification of the three service branches into the Canadian Forces saw HMCS Shearwater change its name to Canadian Forces Base Shearwater (CFB Shearwater). Base rationalization and defence budget cutbacks for the Canadian Forces during the mid-1990s saw a largely administrative move when the formation CFB Shearwater stood down and the facilities transferred to the formation CFB Halifax and aircraft operations becoming the responsibility of newly formed 12 Wing. 12 Wing is headquartered at Shearwater and reports to 1 Canadian Air Division. By 2002 only runway 10/28 remained open. As part of the Department of National Defence's Shearwater Heliport Conversion Project, runway 10H/28H was reduced in length to the east end only in July 2007. At the same time, runway 16H/34H was reopened, however for helicopter operations only. These changes allowed for heliport operations including instrument approaches and were accompanied with the construction of other non-airfield facilities in support of the Maritime Helicopter Project. Shearwater Heliport opened July 31, 2008, consisting of a new 16H/34H and various helipads for helicopter operations only. As part of the heliport conversion project, the old runway 16/34 was permanently closed and placed outside (east) of a new fence for the Shearwater Heliport, as shown in the Canada Flight Supplement effective 31 July 2008. This land for the old runway 16/34 was then transferred by the Department of National Defence to the Canada Lands Company for sale. On 3 April 2009 the land for the old runway 16/34 was re-transferred from Canada Lands Company back to DND, however its future use is unknown. 12 Wing's squadrons at Shearwater Heliport in Nova Scotia and at Patricia Bay in British Columbia currently operate the Sikorsky CH-124 Sea King but is expected to re-equip with the Sikorsky CH-148 Cyclone commencing in 2012 with the conclusion of the Maritime Helicopter Project. There are currently numerous construction projects ongoing at Shearwater Heliport in support of the Maritime Helicopter Project, including the Maritime Helicopter Training Centre where No. 406 Squadron will be located, as well as a new No.423 (MH) Squadron hangar facility, a new 12 Air Maintenance Squadron facility with 6 repair bays, and a new Operational Support Facility where the Helicopter Operational Test and Evaluation Facility (HOTEF) and various 12 Wing headquarter functions will be located. Shearwater Jetty - docks and shore-based infrastructure largely supports the fleet operations of Maritime Forces Atlantic and function as the home to Fleet Diving Unit Atlantic (FDU-A), as well as providing secure docking facilities (isolated from downtown Halifax) for visiting NATO warships including nuclear-powered submarines and aircraft carriers. The Shearwater Heliport is the location of the headquarters of 12 Wing, whose sole purpose is to support and operate shipborne helicopters for the Royal Canadian Navy. 12 Wing is a RCAF unit and reports to 1 Canadian Air Division. 406 Maritime Operational Training Squadron is an operational training squadron for training all maritime helicopter aircrew in the Canadian Forces. 423 Maritime Helicopter Squadron is an operational squadron at Shearwater Heliport which provides CH-148 Cyclone helicopters for Maritime Forces Atlantic warships. 12 Air Maintenance Squadron provides aircraft maintenance and engineering support to 12 Wing's operational squadrons. Helicopter Operational and Test Evaluation Facility (HOTEF) is responsible for researching and testing state-of-the-art equipment for the CH-124 Sea King to enable crews to operate efficiently, ashore or while deployed. 443 Maritime Helicopter Squadron is an operational squadron which provides CH-124 Sea King helicopters for Maritime Forces Pacific warships. Beginning in the 1970s, CFB Shearwater began hosting an Armed Forces Day every fall, typically on the weekend following Labour Day, and included an air show where the long and wide runways at Shearwater hosted some of the largest aircraft in the world, including the U.S. Air Force's C-5 Galaxy transport planes and B-52 Stratofortress bombers. Defence cutbacks and unit and facility realignments from 1994 to 1996 saw CFB Shearwater stand down as a separate formation and the facility merged as an airfield attached to CFB Halifax. At this time, the military-organized "Shearwater International Air Show" was transferred to a civilian organization that saw the event renamed to the "Nova Scotia International Air Show." Organizers of the "Nova Scotia International Air Show" continued to make use the Shearwater airfield for both ground displays and the air show component until 2002. Modifications to the airfield from 2002 onward as part of the Shearwater Heliport Conversion Project saw runways closed, eliminating the ability of fixed-wing aircraft to land at Shearwater, forcing the airshow to remove the static (ground) display component of the event, with the air show component continuing to be staged in the skies over Shearwater (using the nearby Halifax Stanfield International Airport as the fixed-wing airfield). The inconvenience of not having a ground component for the "Nova Scotia International Air Show" as a result of the Shearwater Heliport Conversion Project saw the entire event moved to Halifax Stanfield International Airport beginning in 2004. From 2004 to 2008 the show was held at Halifax Stanfield International Airport which allowed for both static (ground) display and air show at the same venue, however the airport was deemed unsuitable due to numerous interruptions in the air show component by civilian air traffic movements. The air show moved to Yarmouth Airport in 2009 but returned to Shearwater in 2010, the first time since 2003 that an air show was held at the historic airfield (but again with no ground component). In 2011 the air show was renamed the "Atlantic Canada International Airshow" and was held at the Summerside Airport, formerly CFB Summerside, to commemorate the 70th anniversary of the establishment of that base. Organizers have stated that the "Atlantic Canada International Air Show" will likely rotate through the Shearwater airfield every second year. Milberry, Larry, ed. Sixty Years—The RCAF and CF Air Command 1924–1984. Toronto: Canav Books, 1984. ISBN 0-9690703-4-9. Past three hours METARs, SPECI and current TAFs for 12 Wing Shearwater from Nav Canada as available. This page was last edited on 26 November 2018, at 22:31 (UTC).